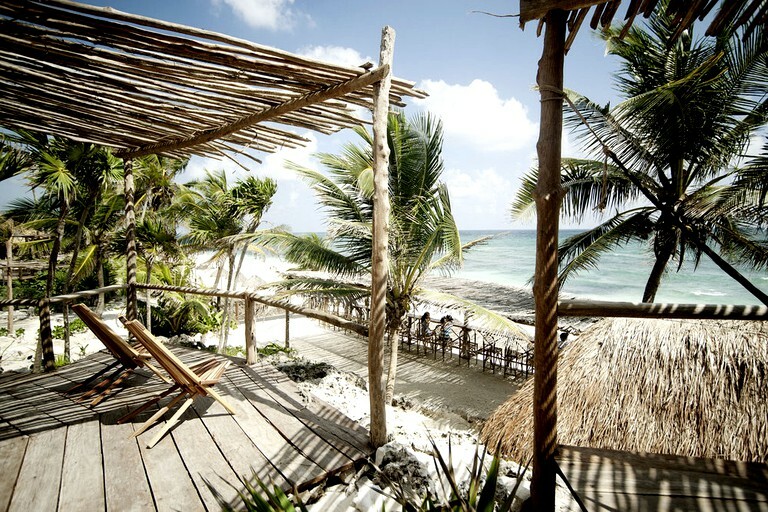 This luxury accommodation can be found along the pristine beach in Tulum, Mexico, and can accommodate four glampers looking to enjoy the sun and sand. Inside, the hut features two double-size beds and a private bathroom. 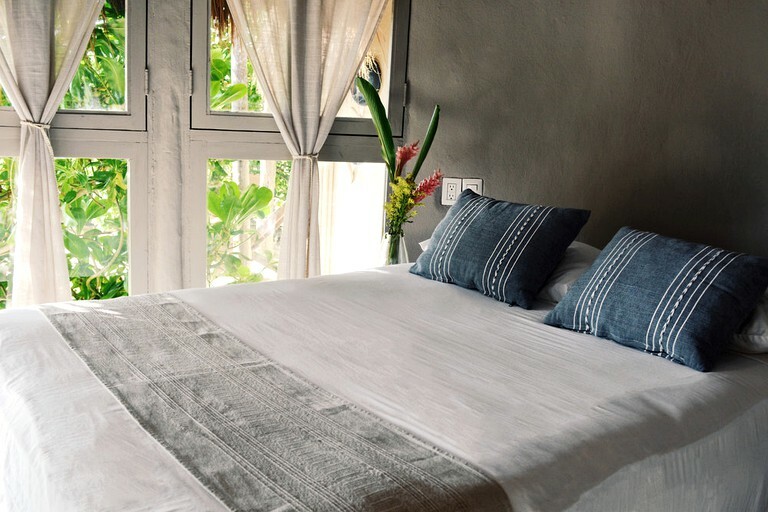 Linens, bath towels, and beach towels are provided for guests. The hut features simple electric lighting and plenty of candles, while electric devices can be charged in the reception area. Wi-Fi is not available in the hut, however, can be accessed in the reception area and in the restaurant found on the property. Outside, guests can savor the incredible ocean views from the private terrace which boasts comfortable lounge furniture and hammocks, making it the perfect spot to relax with a post-sun beverage. From luxury suites and simple cabañas to stylish beach houses nestled in the jungle and amazing views of the pristine ocean, this glamping complex offers 24-hour front desk support, as well as security guards 24/7. 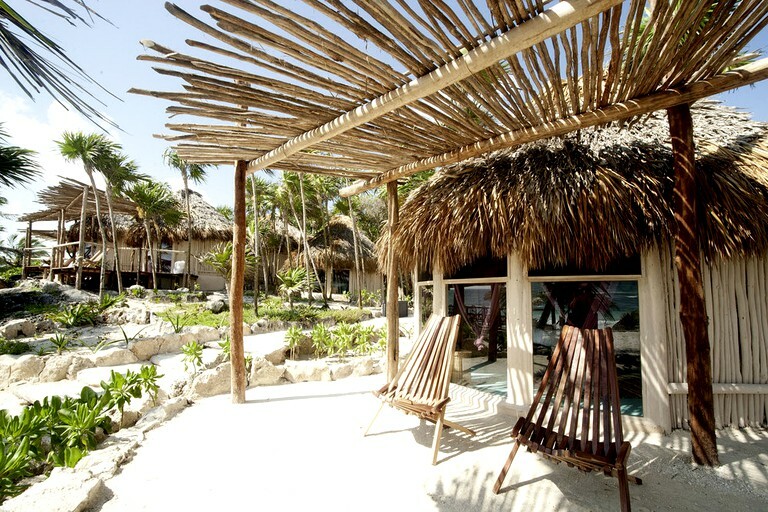 The architecture and interior design implement local materials like palapa, or thatched- roofing, to preserve Mayan culture. 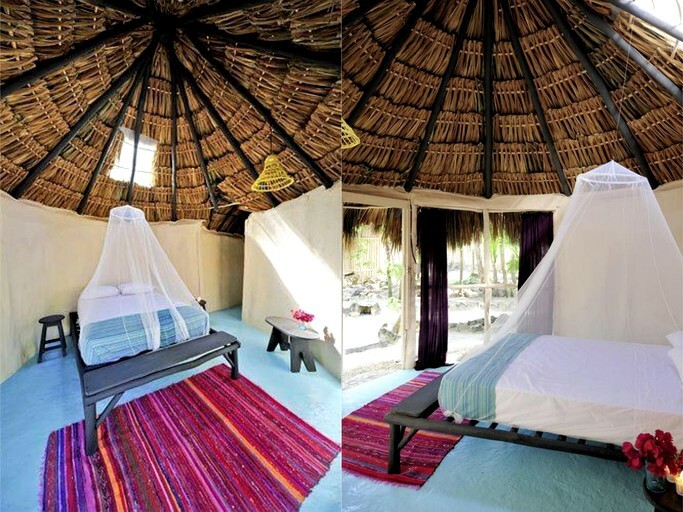 The simplicity and no-frills furnishings of the cabañas give them a special charm. Wi-Fi is limited to the site’s restaurant/beach club and front desk area, which encourages guests to soak in the warmth of the elements and surroundings during their stay. This glamping property also makes music a key component of the experience, which is why the beach club features various DJ’s sets during the day, special events, and the traditional Monthy Full Moon Party. The on-site restaurant is one of the central features of this glamping spot. As part of a holistic experience, the restaurant boasts locally sourced specialties. It includes a double-decker bar that advances toward the ocean, a multilevel semi-amphitheater with private seating enclaves with the infinity view ahead and above, a 360-degree wooden tower rising above the property offering a vantage-point, private table area and a gorgeous stretch of beach with sun beds and shaded hanging beds. The menu is based on recipes largely influenced by the Mayan and Mexican traditions with a touch of experimentation. Ingredients are bought at the local organic market. The kitchen is often the host to famous international chefs invited to introduce their signature and thematic menus. Guests can purchase items for a mini-bar for an additional cost. 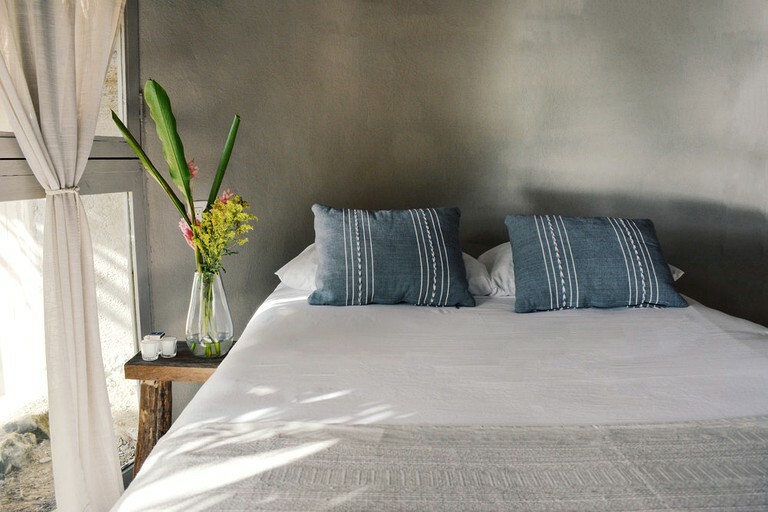 Guests can also participate in the following activities: morning yoga classes, temazcal ceremonies, shamanic sessions, massages, and beauty treatments at the holistic spa. The property also offers various tours, snorkeling in the best cenotes of the area, as well as diving, sightseeing, and more. Bikes can be rented at the tour center. Glampers can also rent paddle boards and kayaks, as well as sign up for kite-surf lessons at the school on the property. Glampers will love the array of daily events offered at this glamping site in Mexico. Please find those events detailed below. Tuesday through Sunday: From 12 p.m. to 6 p.m., enjoy live DJ sets at the beach club. Thursday: From 8 p.m. to 10 p.m., there will be a movie paying. Friday: Enjoy live bands from 8 p.m. to 10 p.m.
Saturday: There are live DJ sets from 8 p.m. to 2 p.m. In addition, there are monthly full moon parties on the following dates: May 2, June 6, July 4, August 1, August 29, September 26, October 31, November 28, and December 26. For more information about activities offered at this glamping site, please read below. Body Soul and Mind: The Sensorial Spa “CHAK EK” is based on a cosmo-vision concept that joins together holistic, therapeutic and medicinal properties by stimulating the senses, thereby evoking an overall spiritual well-being and conveying emotional support, affection and respect. 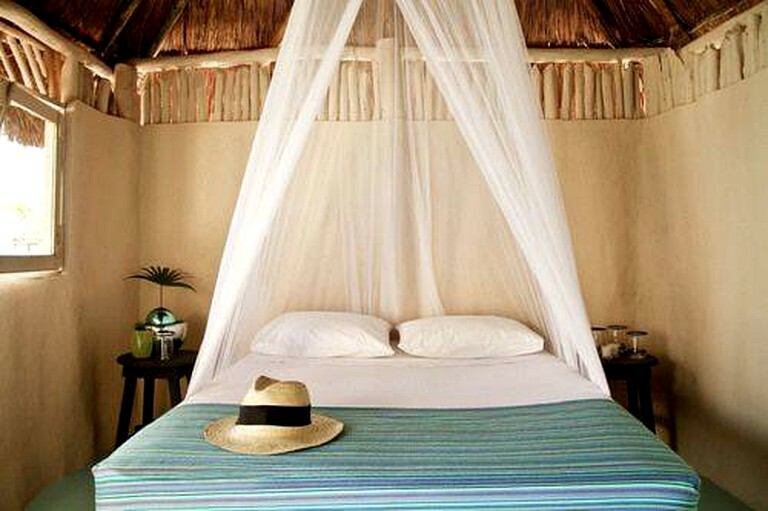 It is set deep in the heart of mystical Mayan Tulum, where the luscious jungle kisses a pristine beach. 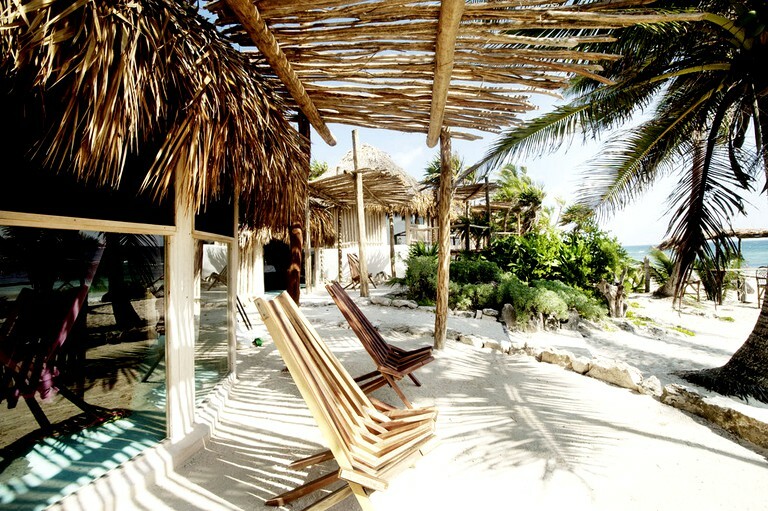 Tour Center: Quelonian Divers is a cultural-Mayan tour center and open from Monday to Saturday at the property's beach club. It is the best place to get information on cultural excursions and water activities around the property, as well as to book your personalized holiday adventure. The Sian Kite Water Sports Center and Kiteboarding School: The Sian Kite Water Sports Center and Kite Boarding School gives you the breathtaking opportunity to enjoy the beauty of the Caribbean Sea by riding the waves. It offers kiteboarding lessons for all skill levels, from complete beginner courses to advanced coaching with pro riders, always putting safety and passion first. The Sian Kite Center team says that kiteboarding is addictive and invites you to pass by and experience it on your own. They offer a variety of surf programs for all ages and skills levels. The friendly, safe and qualified instructors will teach you the correct process in learning to surf and have fun​​​​​​. Body and Soul Treatments: Located beach-side on the property's natural rocky ledge, the Sensorial Spa offers a selection of physical and spiritual treatments delivered by local therapists including the resorts resident shaman. Guests should note that meals and drinks are not included in the booking price but there are several packages available which include a tasty breakfast. Guests should inquire with the hosts for more details. 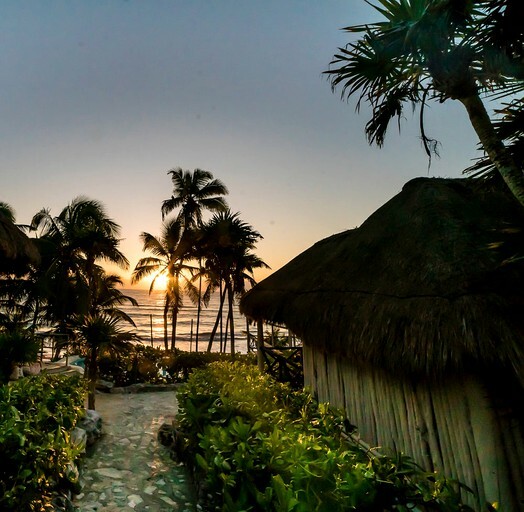 To ensure that future generations continue enjoying the natural beauty of a paradise that Tulum is, this property is committed to reducing the carbon footprint. In doing so, please take the following into consideration. The glamping site’s water comes from an ancient well on the property, and it may be salty. The hotel produces electrical power through generators. That’s why only some cabañas have AC and outlets. Internet signal is received by satellite dish, and it is sensitive to the changing weather conditions. 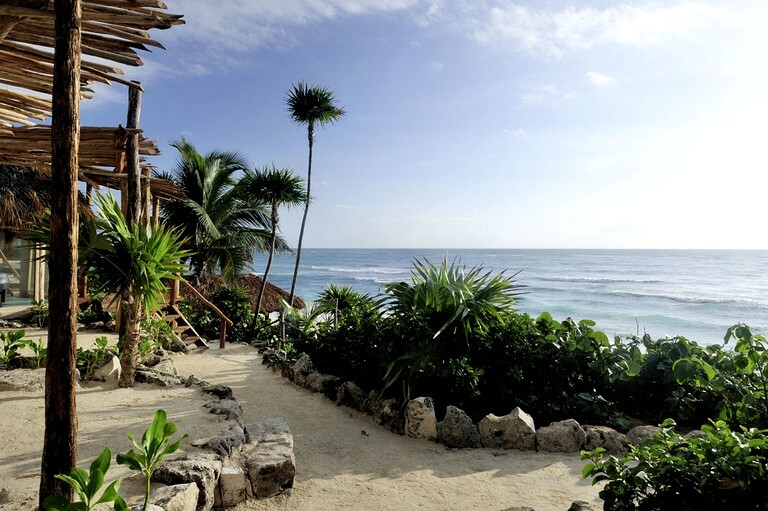 Tulum does not have landlines, so there are no telephones in the hotel.